This is the story of Bertie by Colin Firth, the Duke of York who would later be forced to become King George VI of England, after his brother King Edward VIII decides to advocate the throne to marry American divorcee Wallis Simpsons. Bertie has suffered from a speech impediment since early childhood, which makes public speaking engagements an agonising embarrassment. Until his wife Elizabeth, later the Queen, played by Helena Bonham Carte, seeks the help of Australian elocutionist Lionel Logue played by Geoffrey Rush. Through a variety of strange and unorthodox techniques and hard work from both men’s part over the course a number of years, Bertie’s speech improves dramatically giving him the confidence needed to be a king that his country can all stand behind in the face of a pending war with Germany. This is such a wonderful movie. Delightful and inspiring that’s driven by a showcase of performances that are nothing short of brilliant. Colin Firth is absolutely amazing as Bertie, a tortured man whose pain is so evident when he struggles to perform the task of simply speaking; it’s really heart breaking to watch. Geoffrey Rush is great as the unconventional Australian elocutionist, a very caring and somewhat peculiar man who provides many of the film’s comedic moments. Helena Bonham Carter is lovely as Queen Elizabeth, who portrays a very patient and loving wife to her husband. And who is far more attractive to look at than her real life counterpart. The cinematography is excellent with bland colours and great shots of the actors in the many gorgeous sets. And the city of London is completely blanketed with fog to create that true foggy London feel. 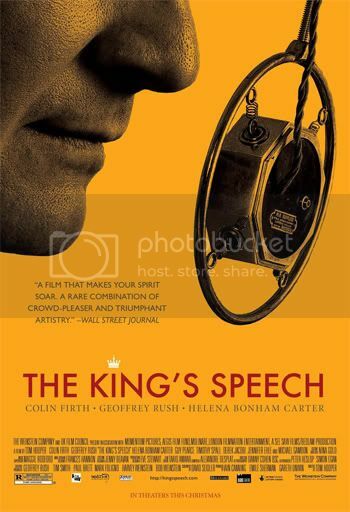 The King’s Speech is funny, sad, uplifting, inspiring and if you want to see acting at its finest then this is the film to see; an absolute triumph. I enjoyed it so much that I think it’s going to be the best film I’ve seen this year. I very much look forward to seeing it again upon its DVD/Blu-ray release. Kevin you really must stop - I'm supposed to be downsizing and now I want this movie too! You still have time to downsize more Kathy...this one isn't on DVD yet. I want to see this one too sometime. May have to wait and rent it though. You need to stop kidding yourself Kathy, you're never going to downsize. Just before tomorrow's very likely travesty of The King's Speech winning in several Oscar categories, the movie has been re-released in the US in a censored PG-13 version. This is slightly different to the censored The Ghost Writer where the original version never hit US cinemas. Just before tomorrow's very likely travesty of The King's Speech winning in several Oscar categories.